The new Expedition Grade Liner Mitt are in many ways an upgrade to their previous undermitts, bringing forth the latest advancements in fabrics for extra durability and water resistance, and stuffing even more goose down into them! They include some pull loops to keep them snug, are filled with 900fp goose down, and are using Nobul fabric. The new Foldback Fingerless mitts are pretty sweet for those that need a pair of gloves in super cold weather and have the need to have access to your fingers. This could be great if you need to do camp chores, perform maintenance on your gear, have the ability to move your compass bezel during cold weather navigation, or a whole host of other finger-required duties. The new Foldback Fingerless Mitt from Black Rock Gear. 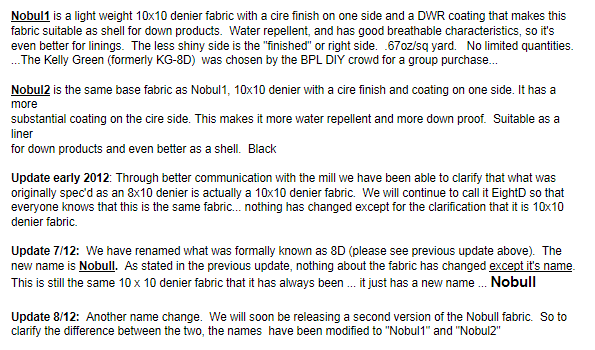 Nobul is a 10D x 10D Nylon which has a cire finish on one side and a DWR coating on the other. Reference this image for further info on this material… it has an interesting history way beyond what is indicated. The DWR coating on one side of the fabric means it can handle light amounts of rain, but if you are planning on using these gloves in the rain or snow you should probably consider buying (if you do not already own them – and you should) a pair of Mountain Laurel Designs eVENT rain mitts as overmitts. If you are expecting to be in super cold conditions and if you have have hands that sweat a lot you should consider buying a pair one size larger and wearing a pair of PossumDown gloves as a next-to-skin layer to soak up all of the sweat from your hands. While there are still a lot of on-going debates about whether 900fp goose down is hyper-sensitive to moisture, and I am within the small crowd of those who believe it is, this could be a wise approach to your winter layering system. I talk more about this in my Preparing For Shoulder/Winter Season Clothing article. As for the 20d DWR coated nylon that is used, I do not have a lot of information about it, but I have been using Black Rock Gear products that use it for awhile and it has been tough enough for the abuse I have given gear that uses it. For the past year I have been testing out prototypes of the new glove liner mitt and they have just been amazing! I have never once thought or had concern that I might tear the fabric of the liners. Granted I have been using them as liners and not an outermitt, as one is suppose to when it comes to liners. 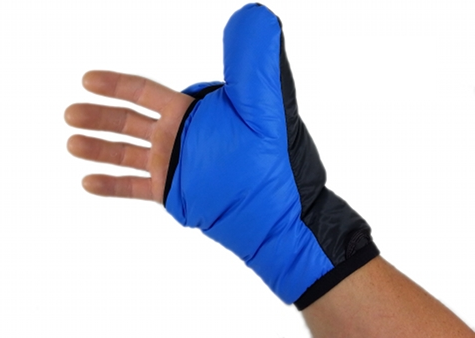 The switch to using 20d for the fingerless mitts is a great move on their part, as folks are more likely to wear these without an overglove of some type. The Expedition Grade Liner Mitts are only 40 grams (1.41 ounces) for a size medium and 44.5 grams (1.57 ounces) for a size large. The Foldback Fingerless mitts are only 41 grams (1.44 ounces) for a size medium and 46.2 grams (1.63 ounces) for a size large. Black Rock Gear has never indicated on their website how much goose down they include in each of their gloves – I suppose those of you with insight into the weight of fabrics could do the math and figure it out (let me know if you do) so I have no information to share on that issue, suffice to say I have been using BRG undermitts since they were released and I have never once had them on and had my hands get cold. All garments from Black Rock Gear can be purchased directly from their website. They ship to both domestic and international destinations – and are based out of Seattle, Washington. I was jealous that everyone had a pair of the regular inner but me. Now I’m so happy I waited so I could pick from one of these amazing new gloves!! Now I have to decide do I want the expedition gloves to keep my frozen lady hands warm or the Foldbacks for superior shelter setup in the cold!